When it comes to teeth cleaning, Pointe Dental Group can help you separate fact from fiction, starting with the basics about brushing. Brushing twice a day is important to maintain good dental health – it’s the starting point to a strong Preventative Dental Care routine. But how you brush, what you brush with, and what you need to do to supplement your brushing is as important as how often you brush. A quick swipe of the brush over your teeth twice each day will not effectively clean your pearly whites. recommends brushing for a minimum of two minutes for a thorough cleaning, one minute for the uppers and one for the lowers. If you have trouble keeping track of how long you’ve been brushing, set a timer or invest in a toothbrush with a built-in timer (this is a great way to make sure kids are brushing as long as they should). How long you brush, however, isn’t nearly as important as how effectively you brush. Brush using short strokes, moving back and forth against the teeth and gums, making sure you’ve made contact with every surface of the tooth. Use the tip of the brush to reach behind each front tooth on the top and the bottom – the back of these teeth are easy to neglect, but they’re a prime hiding spot for plaque and tartar. That being said, is it possible to brush too much? The answer is, “yes.” As previously mentioned, we recommend brushing your teeth twice a day. If you have indulged in sugary sweets or staining foods such as blueberries, coffee, tea, colored soda, or red wine, you might want to follow up with an additional brushing. If you brush too often – or too hard – you can damage or irritate the gums and wear away the enamel. Once you’ve done this, you’ve opened the door for bacteria to enter and start doing its dirty work. In the same way brushing too hard or too often can do more harm than good, so can stiff-bristled toothbrushes. Hard bristles can damage the protective enamel of the tooth and lacerate your gums, giving bacteria a way to enter your tooth or your bloodstream. If you have stiff-bristled brushes, don’t throw them out. Recycle them for household use. They’re perfect for cleaning the nooks and crannies in your home, but not the ones in your teeth. If you ever hear this myth, warning sirens should be going off in your head. You could take home the gold in the brushing Olympics, but you still need to floss! Why? Because if you’re not flossing, you’re missing almost 33% of the places your brush can’t reach; places that make a nice home for decay-causing bacteria. Traditional floss: Waxed, unwaxed, flavored, or wider “dental tape” – a search of your pharmacy or grocery store can help you find your ideal floss. 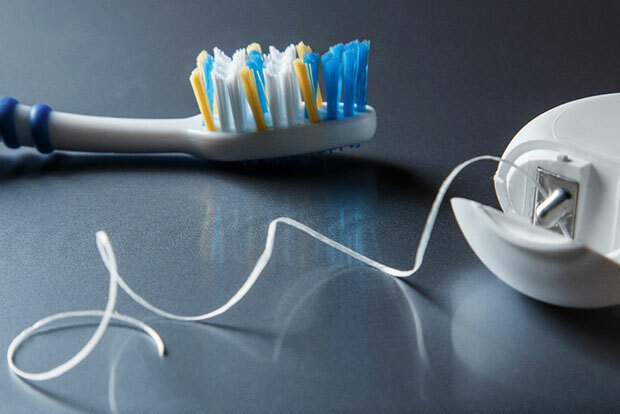 If you have difficulty holding on to your floss or reaching your back teeth, purchase a dental floss holder which you can string with your favorite floss. Floss picks: These are handy little disposable devices with pre-strung floss on one side and a pick on the other. They’re perfect for on-the-go flossing. Water flossers (aka Waterpiks): These units pressurize water through a narrow, hand-held tube which you can use to remove bacteria and plaque around teeth. They’re particularly useful for cleaning in and around braces and behind wisdom teeth. Find out more by reading our blog about them. Interdental brushes: Available in manual and power forms, these tiny brushes clean plaque between teeth. We want to help you maintain good oral health and a beautiful smile. Regular teeth cleaning and dental check-ups are an important part of your routine, just like brushing and flossing. Schedule an appointment with us, or call and take the first step toward keeping your smile radiant. This entry was posted in Dental Tips, General Dentistry and tagged Bad Breath, Dental Tips, Tooth Decay. Bookmark the permalink. Follow any comments here with the RSS feed for this post. Both comments and trackbacks are currently closed.